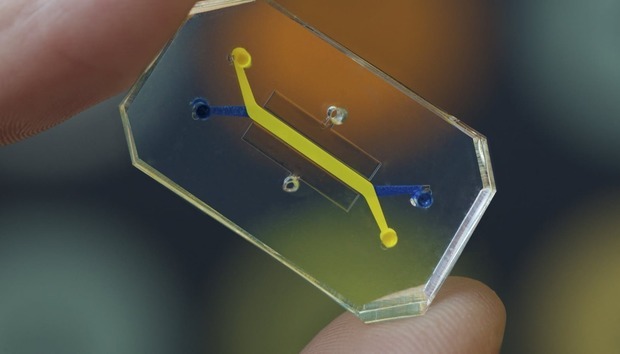 Tissue-on-a-chip technology may someday lead to replicating a patient's specific genetic disorder in a laboratory, matching the properties of a disease or even an individual patient's cells for testing and treatment purposes. The results of the research by Harvard's John A. Paulson School of Engineering and Applied Sciences (SEAS) and the Wyss Institute for Biologically Inspired Engineering at Harvard were published in the peer-reviewed journal Nature Materials. "We are pushing the boundaries of three-dimensional printing by developing and integrating multiple functional materials within printed devices," Jennifer Lewis, Hansjorg Wyss Professor of Biologically Inspired Engineering and coauthor of the study, said in a news release. "This study is a powerful demonstration of how our platform can be used to create fully functional, instrumented chips for drug screening and disease modeling." While Harvard researchers have developed 3D-bioprinted heart tissue on a chip in the past, the embedded sensors on the new chip allow them to easily record data from multiple tissues at one time and over extended periods, according to Johan Ulrik Lind, first author of the paper and a postdoctoral fellow at the SEAS. "The data we get from the sensors is the most critical information pertaining to cardiac tissue: the strength of the 'heart beat' and the beat rate," Lind stated in an email to Computerworld. "This enables us to study how the tissue responds to drugs and toxic compounds. Because pharmaceutical research can involve [tests of] thousands of compounds, this is an important improvement over previous work." Typically, disease research is conducted through clinical studies, which can take years to complete, and testing a single drug compound can cost more than $2 billion, according to the Wyss Institute. In addition, thousands of animals are typically killed in order to test new drug treatments - a process that often fails to truly replicate a human response to the therapy because animals do not accurately mimic human pathophysiology. The Harvard researchers first fabricated microchips that recapitulate the microarchitecture and functions of living human organs, which so far have included lungs, intestines, kidneys, skins and bone marrow. The microchips, called "organs-on-chips," are made of a clear flexible polymer about the size of a computer memory stick that contain hollow microfluid channels connected with cell-lined artificial blood vessels. Researchers are then able to apply mechanical forces to the chip to mimic the physical microenvironment of living organs, including breathing motions in lungs and peristalsis-like deformations in the intestine. The researchers can literally take skin cells from a patient that suffers from a heart complication and turn the cells into stem cells, which can then be made into cardiac cells, Lind explained. Those heart cells then match the exact genetic profile of the patient. "By making a heart-on-a-chip device with those cells, we could then investigate potential therapies for that specific patient," Lind said. "This might sound a bit like science fiction, but our lab has already been part of investigating patient specific therapies using heart-on-a-chip devices in a previous study." The latest 3D, bioprinted heart-on-a-chip can be quickly fabricated using an automated process, but it also allows for customization of individual patients by using their own cells, which enables researchers to collect reliable data for short-term and long-term studies. "Because the entire device is 3D printed, we can easily change design to accommodate, for instance, a specific cell source. This will in the future enable us to tailor the device to heart tissue derived from induced stem cells from a specific patient," Lind said. "This new programmable approach to building organs-on-chips not only allows us to easily change and customize the design of the system by integrating sensing but also drastically simplifies data acquisition." The Wyss Institute is not alone in its development of 3D bioprinting for drug testing. Along with research at other universities, 3D bioprinting technology for medical research and therapeutic applications has also been accomplished by San Diego-based Organovo, which printed the first human liver on a chip in 2014. Organovo also began printing human skin, which could be made from a patient's own cells and used for grafting. Also in 2014, MaRS Innovations collaborated with the University of Toronto to create the PrintAlive Bioprinter, which it commercialized for the purpose of printing human skin. « Was the Dyn DDoS attack actually a script kiddie v. PSN?